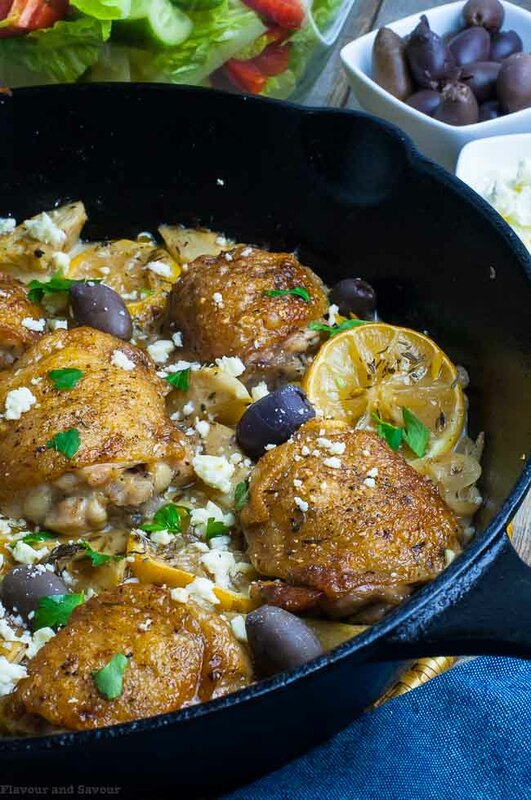 This Baked Lemon Artichoke Chicken recipe is all made in one pan. Full of the robust flavours of the sunny Mediterranean, it’s seasoned with garlic, lemon, olives, feta cheese, and of course, artichokes! 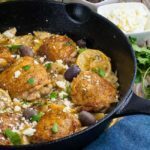 This One-Pan Baked Lemon Artichoke Chicken makes an easy weeknight chicken dinner, all made in one skillet. It’s an appetizing dish, with complex flavours that blend together seamlessly. The result is a 30-minute meal with crispy chicken and a pungent sauce. Ready to get started? Here’s what you’ll need. 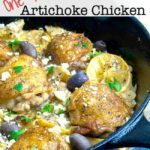 Assemble everything on your countertop and cooking this artichoke chicken dish will be a breeze. 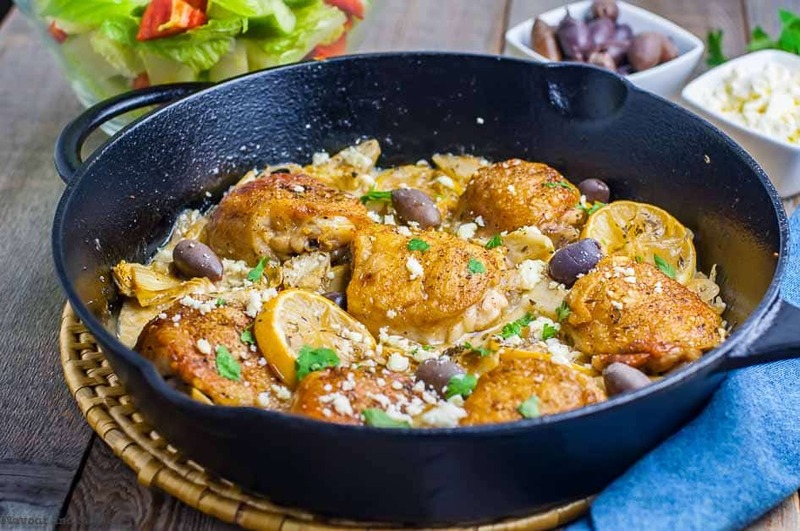 Sear the chicken thighs in an oven-proof skillet. Brown the shallots and garlic in the same skillet. 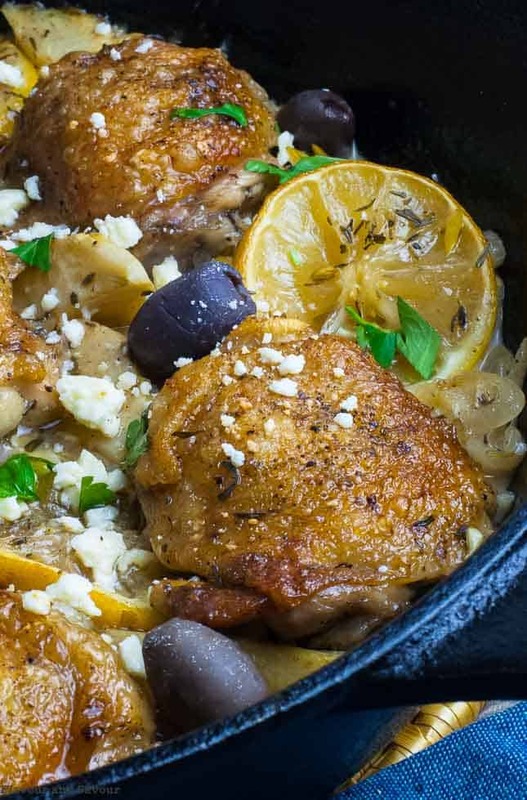 Then add all the remaining ingredients except the olives, feta and parsley to the skillet. 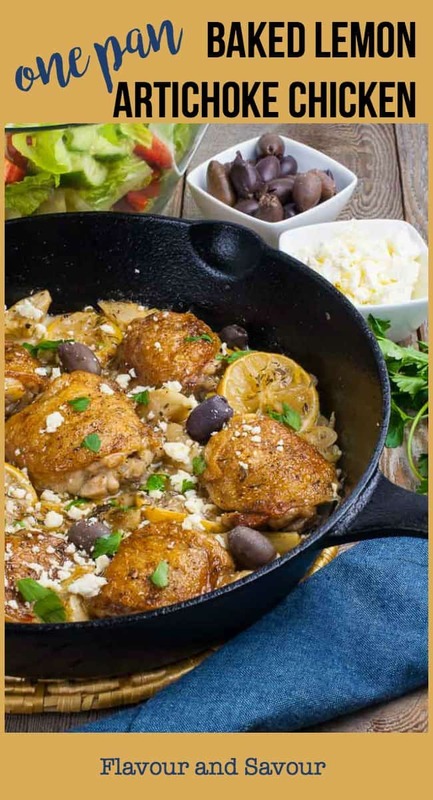 When the chicken is fully cooked, add the olives and feta and place under the broiler for a couple of minutes. 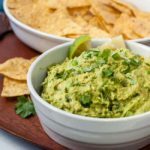 Garnish with parsley, serve and devour! 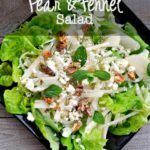 Make it paleo: omit the feta cheese on top. 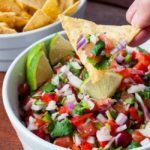 Serve with a salad and a baked potato or a baked sweet potato with Tzatziki Sauce. 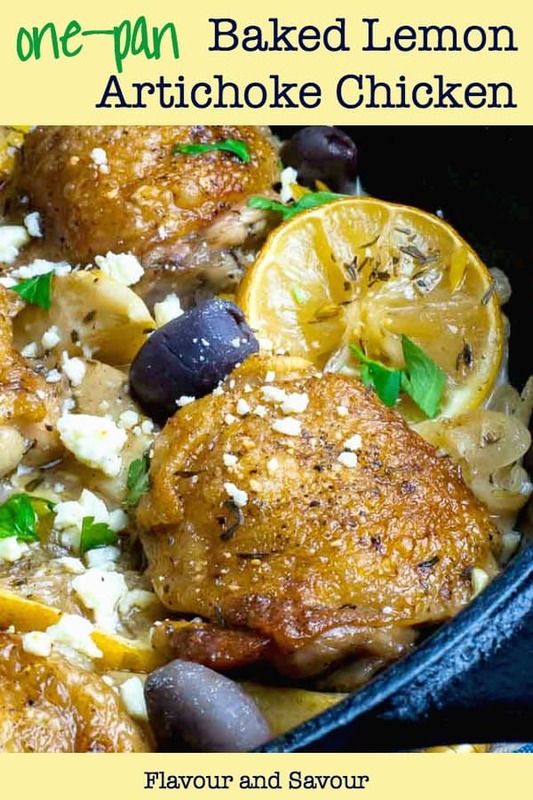 This Baked Lemon Artichoke Chicken recipe is all made in one pan. 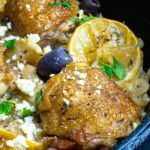 Full of the robust flavours of the sunny Mediterranean, it's seasoned with garlic, lemon, olives, feta cheese, and of course, artichokes! Preheat oven to 375°F. Pat the chicken thighs dry, then season with salt and pepper. 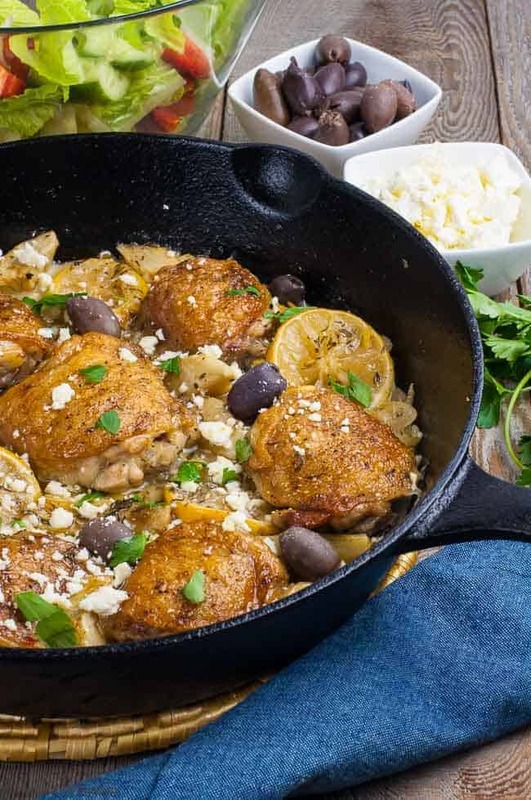 In a large oven-proof skillet, heat 1 tbsp olive oil. When hot, add chicken, skin side down. Sear for 4 -5 minutes, then turn and sear on the other side. Remove to a plate. Drain all but 1 tbsp of the oil or chicken fat. Add shallots and garlic to the skillet. Cook for 1 - 2 minutes until softened and just beginning to brown. Add artichoke hearts, lemon, brine, thyme, chicken stock and white wine. 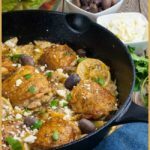 Bring to a simmer, then add chicken thighs back to the skillet. Transfer to preheated oven and bake for 20 - 25 minutes or until chicken registers an internal temperature of 170°F. Tuck the olives into the sauce, sprinkle with feta and heat under the broiler for 2 - 3 minutes. Serve and devour! 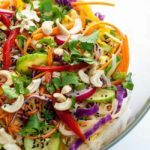 This was a very easy recipe for a very flavorful dish. My husband and I ate it 2 nights in a row. We don’t like feta, so we left it out. And I used Chicken tenders, which I seared and cut into bite sized pieces. Next time I think I will add 2 Tablespoons flour to the dish when I add the chicken back in, to thicken the broth, which had a wonderful flavor. We served this over a bed of freshly chopped spinach.